Former striker Steve Howard enjoyed multiple promotions in his career but winning the Championship play-offs with Derby County in 2007 took him to the big time, and it wasn’t just the goals that the ex-Leicester City and Luton Town favourite was responsible for that season. In a professional career that yielded well over 700 games, the robust frontman hit the target in each of English football’s top four divisions. With 209 goals overall to his name, the one-time Hartlepool United youngster (and veteran) won promotion on five occasions, endearing himself to many along the way. Playing the full game and winning the Championship play-off final for Derby County at Wembley in front of almost 75,000 ranks as an incredible high point for Steve, with his chance in the Premier League subsequently arriving soon after. In a season of mostly winning football for The Rams, he led the scoring charts with 19 goals in total on their way to the top flight. From the successful 2006/07 campaign, goalkeeper Lee Grant, defenders Michael Johnson and Dean Leacock, captain Matt Oakley and attacking starlet Giles Barnes have each featured in their own music/football interview on here. Steve is the latest from Billy Davies’ squad that season to appear on this site, and besides all the goals he contributed and the on-pitch battles he fought, the £1million signing exerted his influence in an altogether different way, as he explains. According to some of the players, The Rams had midfielder Seth Johnson’s extraordinarily sub-standard track choices to contend with at times during those days, so the likes of Steve were a welcome antidote! A leading marksman as Luton climbed the divisions, observers of the game became familiar with his rugged but undoubtedly effective style of forward play. The scourge of numerous opposing teams through the years, Steve was a roofer before he made it as a professional footballer. As he describes how often music comes into his life from one day to the next he also reveals one of the ways he uses it for some escape, which might surprise some when they think of the bustling striker who dominated so many defences. “I relax a lot by trying to play the piano. I play a bit but not to any great standard…in my head I’m brilliant though! “I love music. I love all kinds of music, from classical to rap, all depending on my mood. A Newcastle United fan but an ex-Middlesbrough youth, Steve actually had to take a pay cut from his aforementioned roofing job to sign for Hartlepool in 1995. Having made his breakthrough in the Football League with Pools he joined Northampton Town in 1999, where he would win promotion to Division Two in 2000 under Kevin Wilson. A March 2001 switch to Luton Town ushered in a five-year spell which would be the most prolific of his career. With promotion to the third tier secured during Joe Kinnear’s tenure at Kenilworth Road, the League One title was then won by the Hatters under Mike Newell in 2005, with Steve scoring 22 times over the season. An outstanding tally of 103 goals in Luton colours meant he was a definite favourite at the club, and after notching 15 to help the side to 10th in the Championship in 2005/06, it was off to Derby. 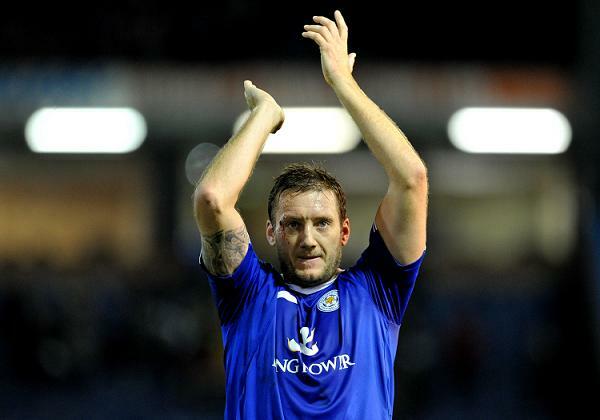 By the time of his move to Leicester in January 2008 he had already firmly established his credentials in the second tier, but he would need to help drag the Foxes back up to that level following relegation a few months after his arrival. Although no Leicester fan wanted to see the club in League One, the 2008/09 season allowed new boss Nigel Pearson to rebuild the side and he led his charges to the title. Steve was fundamental to that achievement, winning the Players’ and Supporters’ Player of the Year Award as he struck 15 goals, including the unforgettable last-ditch headed winner at home to Leeds United. While at Luton, Steve had managed to learn a great deal from assistant boss and former frontman Mick Harford. Just like the ex-England international mentored him, Steve has often made a point of offering his know-how to younger teammates, with a certain former Leicester strike partner a great example as he scored 32 in the Foxes’ promotion year. It is this player Steve put forward when he answered the question of which career teammate he would record a song cover with, although the original will take some topping! Chris Waddle himself was a recent interview on here and the one-time England winger once represented non-league Tow Law Town in the North East, as did Steve. Although he might not have ever gone down the route of a music career on the side, has Steve ever had to step forward and perform a song for his teammates? 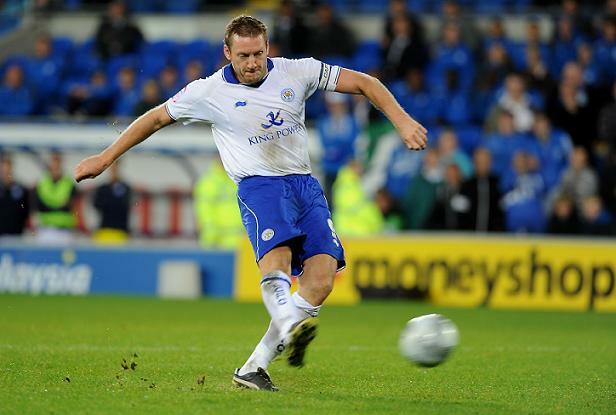 Among Steve’s standout moments in his Leicester spell was a March 2008 hat-trick in a 4-1 win at West Brom, who were heading for the Championship title. Following the Foxes’ return to the division for 2009/10, Nigel Pearson led them to a play-off semi-final with Cardiff City. Forced to sit out the first leg through suspension, Steve was back for the trip to the Welsh capital and more fired up than ever, putting in a terrific performance as he set up Matty Fryatt and played a part in Cardiff skipper Mark Hudson’s own goal. The game went all the way to a penalty shootout after a 3-3 draw on aggregate (3-2 to Leicester on the night) and Steve converted, before the Bluebirds’ David Marshall saved twice – most notably after Yann Kermorgant’s chip – to send the home side to Wembley. One player who missed the play-off games but had featured 40 times that season for Leicester was someone who impressed Steve with a little more than just his commanding displays from the backline. Although Steve would opt for ‘Ol’ Blue Eyes’ if he was to show off his vocal range, this ex-Colchester United and Hull City defender decided to keep it strictly domestic. With current Foxes gaffer Nigel Pearson’s initial reign coming to an end in June 2010, ex-Portugal midfielder and Queens Park Rangers and Swansea City manager Paulo Sousa took over. Three months later, former England boss Sven-Göran Eriksson was next in charge, going on to make a large amount of signings in the summer of 2011. In addition to the money spent on the likes of goalkeeper Kasper Schmeichel, defenders Matt Mills and Wes Morgan, and striker Jermaine Beckford, a number of out-of-contract players were brought in. One of those was Ghanaian international John Paintsil, who had departed Fulham, and Steve recalls a slightly quirky routine the ex-West Ham full-back used to have. “John Paintsil – his taste in music was bizarre to say the least. Every day, he used to walk into the changing room and change the iPod, regardless of what was playing, and start playing his music, start dancing and then walk out! “He used to say the lads weren’t ready for his music and he was teaching us a lesson, in the future of music! To this day I haven’t got a clue who it was by, or what genre you would class it as – awful! In the 2007 play-off semi-final for Derby against Southampton, Steve scored a header and a penalty in the away leg to bring the Rams back to Pride Park with a 2-1 lead. After the Saints levelled it at 4-4 on aggregate in the second game, the tie went to penalties, with Steve proving as reliable as ever with his kick. Former Derby midfielder Iñigo Idiakez was the decisive one to miss in the shootout, firing over the bar and sending his old side to Wembley. Steve’s 20th and last goal for the club was in the Premier League at Old Trafford in December 2007, but long before he was scoring against Manchester United and moving to clubs for seven-figure fees he was a kid in the North East buying his first music, as he recalls. After Leicester, there was one final permanent move of Steve’s career and it came ahead of the 2012/13 season as he put aside Championship interest to re-sign for his first professional club, Hartlepool, in League One. Having scored three goals for Pools that season, all of which were in league fixtures with Sheffield United, including a double to seal a win at Bramall Lane, Steve had an unexpected return to the league above with a loan move to the Steel City with Sheffield Wednesday. Back in 2004, Wednesday had tried to sign Steve from Luton as they put together a League One promotion challenge, but Owls fans instead had to endure him scoring as an opposing player in the years to come. With seven goals to his name against the Owls, even Steve couldn’t have imagined he’d finally be wearing the blue and white at Hillsborough at the age of 36, but so it transpired. Brought in by Dave Jones to aid the relegation battle in the closing weeks of the 2012/13 season, Steve proved himself up for the fight, with his crowning moment arriving in the final match. One of a number of clubs under threat, Wednesday needed a win at home to Middlesbrough to be sure of staying in the Championship and Steve settled the nerves as he went through on goal early on and finished confidently in front of the Kop. It was a great moment in front of 31,375 and a fitting way for Steve to score what turned out to be his last career goal, with The Owls winning 2-0 to pull clear of danger. Leaving Hartlepool in November 2013, Steve has since been able to reflect on a hugely impressive couple of decades in the game for someone who had unsuccessful trials at clubs as a teenager. He shares his thoughts on some of the many lessons in life and football his career has handed him, also identifying the advice he would give to the Steve Howard who was just starting out. “It’s a tough sport to be involved in. Six to eight years is the average career of a professional footballer, and I’ve done 21 years, so I class myself as fortunate. “I learned that I had a desire and determination to succeed when others told me I would fail. I would tell (the younger Steve Howard) to believe in myself and to not take no for an answer, trusting no one apart from family and close friends, and most of all – enjoy it! Steve, who appeared and scored for Scotland B against Ireland in 2007, bought property on numerous occasions during his career. He is now owner of Platinum Capital Investments, with part of his business focusing on advising footballers so they can have their own property when they retire. Away from business, he has a couple of other targets he is working towards, which may or may not come to fruition! 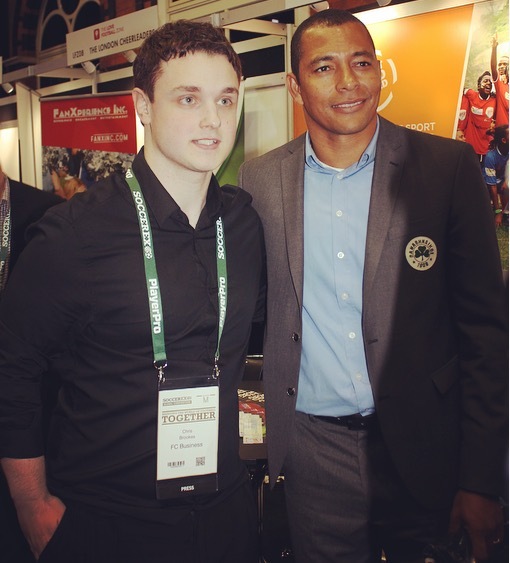 “I am working to grow my company, which takes up a lot of my time, giving footballers and investors an income for life through property investment. I was passionate about doing this as I’d seen so much bad advice given to footballers throughout my career and I wanted to stay involved in the game and give something back. “I am also trying to reduce my golf handicap, which is three at the moment, and trying to play Bruce Hornsby ‘The Way It Is’ faultlessly on the piano! I am enjoying putting most of my time into my business and enjoying the freedom from the restrictions that you have to abide by when you are a footballer. While we might not see the man who once went for fees of £1m and £1.5m stepping onto the field in the Football League again, what about if he was to put his own all-star 5-a-side line-up together? The rule of this regular closing question on here is that the player has to choose four of their career teammates to join them in this fantasy selection. It is over to Steve to introduce the starters for his team and it is likely there would be some fearful opposing defences as they saw him and his strike partner lining up against them! “Keeper: Kasper Schmeichel – the best keeper I have played with. Defender: Darren Moore – on a 5-a-side pitch, nobody is getting past him.